I really don’t want to think about my WiFi router. Ever. I just want it to work. Everywhere in my home. The eero WiFi system promises just that. System set up is done using your iOS or Android device and the downloadable eero app. The eero app will walk you through the set up process step by step and automatically configure the system, creating a WiFi network mesh that allows you to move about your house freely, unlike some WiFi range extenders that require you to switch between networks as you move. 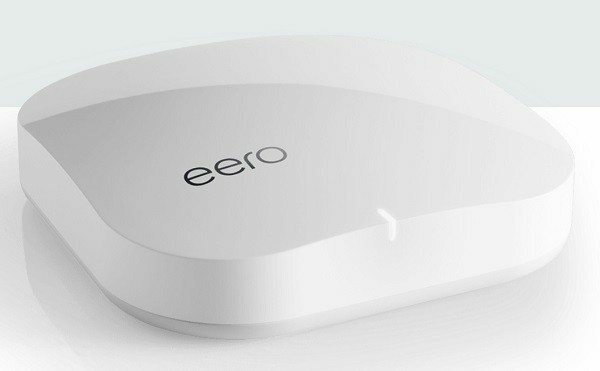 The eero will even automatically update itself as new software releases become available. That’s how I want my WiFi – easy, everywhere and self-sufficient. The eero WiFi system is available at www.eero.com or on Amazon for $199 each or $499 for a 3-pack. They recommend 1 eero per 1000 square feet. WAAAYYY too expensive.. how is this any different or better than an apple airport extreme with one or a couple of airport express mini stations operation as WDS repeaters or alternate access points? Someone like apple makes setup and admin very easy. Heck, even the netgears of the world have made adding simple repeaters simple and user friendly to increase base AP range. I can’t believe these guys received 40M in financing to make new hardware. The eero is one of the new 802.11ac generation of “speedier” routers. D-Link, Linksys and a start up called Luma are releasing 802.11ac routers later this year. The prices on these look to be comparable. They are all higher priced than the 802.11n (released in 2007) routers. The 802.11ac is about 3x faster. It’s nice to have choices. With some of the fastest available internet speeds of 100MB available, nobody is going to notice the difference between 801.11ac spec2 or ac spec 1..
On a local LAN, sure might be something but even then with a solid AP and maybe 1-2 repeaters one is going to see 300-400MB throughput easily with could handle rapid file transfers for 5-10 HD streams from a LAN based media/content server. I just find this solution above to be expensive and unproven at this point when for 95% of users there are existing and cheaper solutions that provide easily as good performance. And not to belabor the point but I don’t believe the 802.11ac in these routers is any different than the 802.11ac that apple and others have been providing for nearly four years now. Yes, Apple is great, and frequently in the forefront of tech. Even so, I’m happy to see competition nipping at it’s heels to keep them sharp.